THE GENERAL COMMITTEE Will meet at Mr. Strause’s Tavern on Saturday next, at 12 o'clock. Punctual attendance is requested. 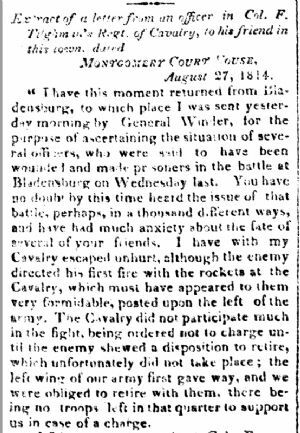 “I have this moment returned from Bladensburg, to which place I was sent yesterday morning by General Winder, for the purpose of ascertaining the situation of several officers, who were said to have been wounded and made prisoners in the battle at Bladensburg on Wednesday last. You have no doubt by this time heard the issue of that battle, perhaps in a thousand different ways, and have had much anxiety about the fate of several of your friends. I have with my Cavalry escaped unhurt, although the enemy directed his first fire with the rockets at the Cavalry, which must have appeared to them Very formidable, posted upon the left of the army. The cavalry did not participate much in the fight, being ordered not to charge until the enemy shewed a disposition to retire, which unfortunately did not take place; the left wing of our army first gave way, and we were obliged to retire with them, there being no troops left in that quarter to support us in case of a charge. “I felt very anxious about Col. Ragan, who was said to have been badly wounded, and in possession of the enemy. I found, however, upon my arrival at Bladensburg, that he had been thrown from his horse in the ion without sustaining any injury ; he was taken prisoner and paroled—he left there yesterday morning for Baltimore, and I presume will return home in a few days, as he cannot serve until exchanged, Commodore Barney and several officers are wounded, and now in Bladensburg. “The British left their men and horses unburied to the field of action. I saw them lying in and near the main road, and had them buried before I left them. “A party of the Cavalry last night took about 100 prisoners at Bladensburg, among them were several officers. Reinforcements are coming in daily to our aid, part of them have been ordered to Baltimore and a part to Washington. “The enemy have returned to their shipping, and it is thought they will next attack Baltimore – they left the city without destroying the Paper Mill, Foundery or Parrott’s Rope-walk, they did not burn Stull & William’s Powder works at Bladensburg. They became alarmed, and retreated with a great deal of caution—-a British captain informed me, they were fearful that General Winder was making arrangements to cut off their retreat to their shipping. We have had very arduous service, having been hovering about .the enemy ever since we have been in service ; we have been for 24 hours without provisions or sleep—-our horses and men are literally broken down with fatigue, yet the men bear it like soldiers and I can truly say they are an honor to any corps.